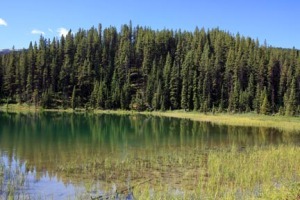 While most visitors focus on Maligne Lake and its boat tours, there are a number of memorable hiking trails radiating from the north end of the lake. Easy trails lead along both sides of the lake, as well as to smaller lakes in the surrounding forest while more strenuous outings climb surrounding mountain slopes above the treeline for sweeping views. Although wildlife is present throughout the Maligne Valley, you should be especially aware when hiking. The Jasper Visitor Centre, in downtown Jasper, issues regular trail reports, or look for bulletins posted at trailhead kiosks. Special caution should be taken on the Opal Hills trail, where grizzly bears roam throughout late spring and summer. 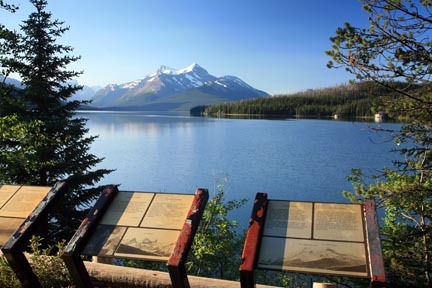 This easy, pleasant walk begins from beside the Boat House, following the eastern shore of Maligne Lake through an open area of lakeside picnic tables to a point known as Schaffer Viewpoint, named for the first white person to see the valley. Across the lake are the aptly named Bald Hills, the Maligne Range, and, to the southwest, the distinctive twin peaks of Mount Unwin (3,268 metres/10,720 feet) and Mount Charlton (3,217 metres/10,550 feet). After dragging yourself away from the spectacular panorama, continue along a shallow bay before following the trail into a forest of spruce and subalpine fir, then looping back to the middle parking lot. 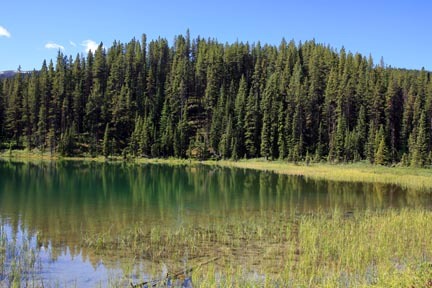 Under three kilometres (1.9 miles), the loop trail that passes by Moose Lake can be completed in one hour and is one of the most enjoyable easy hikes in the vicinity of Maligne Lake. Park at the large parking area at the very end of Maligne Lake Road, walk uphill across the road to the trailhead kiosk at a locked gate. From here, follow the wide Opal Hills trail for 300 metres (0.2 miles), then turn left onto a narrow pathway that crosses a stream and disappears into the forest. One kilometre (0.6 mile) along this trail, a rough track branches left, leading to Moose Lake—a quiet body of water where moose are sometimes seen just after dawn. To return to the parking lot, continue along the trail as it descends to the shore of Maligne Lake. Here the option is to continue left to the parking lot or extend your walk by heading right along the Lakeshore Trail. This pair of forest-encircled lakes takes longer to reach than Moose Lake, but are both delightful destinations that can be combined into a 5.6-kilometre (3.5-mile), two-hour roundtrip roundtrip, or longer if you bring a picnic lunch. The trailhead is 100 metres north (to the left) of the trailhead for Moose Lake and the Bald Hills, across the road from the parking lot at the very end of Maligne Lake Road. The well-formed trail rises and falls through a subalpine forest of mostly lodgepole pine. The uneven topography was created by a rockslide less than 14,000 years ago; along the first section of trail is a steep-sided hollow created by fallen rock. After two kilometres (1.3 miles) of easy hiking, a signed trail leads left at a small pond to Lorraine Lake, which is named for the daughter of Larry and Hilda Magistad, who managed the Curly Phillips Boathouse in the 1940s. The turnoff to Mona Lake is 300 metres (0.2 miles) further along the main trail. It takes less than five minutes to reach both lakes from the main trail. 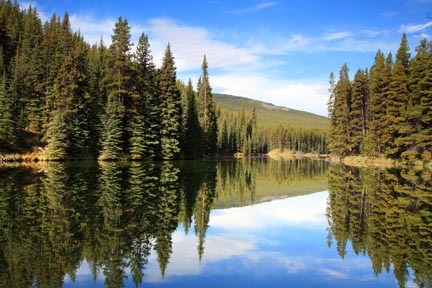 Mona Lake is the larger of the two and offers views north down the Maligne Valley. It also has a more picturesque rocky shoreline. It’s uphill all the way to the Bald Hills, a moderately strenuous 5.2-kilometre (3.2 mile) hike that gains around 500 metres (1,640 feet) of elevation. But the rewards are ample—including a sweeping panorama of Maligne Lake and distant mountains, including the twin peaks of Mount Unwin and Mount Charlton and, across the lake, the Queen Elizabeth Ranges. The trail follows an old fire road the entire way to the official end of trail, passing through lodgepole pine before entering the upper subalpine zone of stunted alpine fir and Engelmann spruce. The trail officially ends at the site of a fire lookout, which has been removed. Beyond the lookout site are seemingly endless alpine meadows. You can easily spend an hour or more exploring the meadows, viewing the antics of marmots and pikas, or identifying the many colourful species of wildflowers. For the energetic, there’s the option of continuing the climb by ascending one of the rocky ridges that give the hills their name. The trailhead is the same as Moose Lake. Follow Maligne Lake Road across the Maligne River to the parking lot and walk back across the road to the locked gate at the base of the fire road. Allow 2.5 to three hours for the roundtrip to the fire lookout site, plus at least an hour or two exploring the meadows. 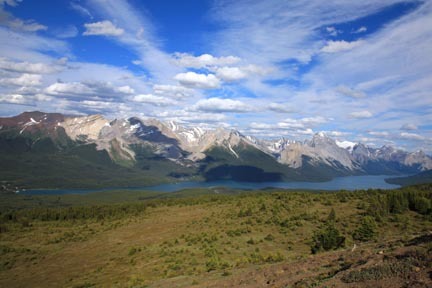 Opposite the Bald Hills, on the east side of Maligne Lake, are the iron-coloured Opal Hills (to the left as you gaze down the lake from the day lodge). An 8.2-kilometre (5.1-mile) trail loops over their lower slopes, which are not the true Opal Hills, but high ridges of boulders created by a rockslide that occurred less than 14,000 years ago. The roundtrip distance is shorter than the trail up to the Bald Hills and back, but as this trail is steeper, you should allow a similar period of time—around 2.5 to three hours to complete the loop. Beginning from the far corner of upper parking area beside the day lodge, the trail passes through a subalpine forest doted with boulders from an ancient rockslide. After 1.6 kilometres (one mile) of steady climbing, the trail forks. This is the start of a 4-8-kilometre (three-mile) loop. The left option gains elevation more slowly that the right, which makes a steep, quick climb above the treeline. Views from the trail summit are not as expansive as from the Bald Hills, but the view is stunning nonetheless. Watchtower is a wide, open basin high above the crowds of Maligne Lake Road. All the elevation gain is made during the first six kilometres (3.7 miles) from Maligne Lake Road, through a dense forest of lodgepole pine and white spruce. As the trail levels off and enters the basin, it continues to follow the west bank of a stream, crossing it at kilometre 10 (mile 6.2) and officially ending at a campground. To the west and south the Maligne Range rises to a crest three kilometres (1.9 miles) beyond the campground. From the top of this ridge, at the intersection with the Skyline Trail, it is 17.5 kilometres (11 miles) northwest to Maligne Canyon, or 27 kilometres (17 miles) southeast to Maligne Lake. By camping at Watchtower Campground, day trips can be made to a small lake in the basin or to highlights of the Skyline Trail such as the Snowbowl, Curator Lake, and Shovel Pass. The appeal of this trail, which begins from the southeast end of Medicine Lake, is its lack of elevation gain and the numerous small lakes it skirts as it travels through a narrow valley. On either side, the severely faulted mountains of the Queen Elizabeth Ranges rise steeply above the valley floor, their strata tilted nearly vertical.